Sweetwater Union High School District is preparing to lay off 200 teachers right as 7th graders are given iPads to replace textbooks. Parents aren’t angry over the district spending money on technology instead of teachers’ salaries. They’re concerned that if the staffers responsible for implementing the program are gone, who will pick up the work? At Hilltop Middle School teachers who helped get the program off the ground have been given pink slips. Sweetwater Union High School District is preparing to lay off 200 teachers right as 7th graders are given iPads to replace textbooks. At Hilltop Middle School teachers who helped get the program off the ground have been given pinkslips, leaving parents and students concerned about the future. 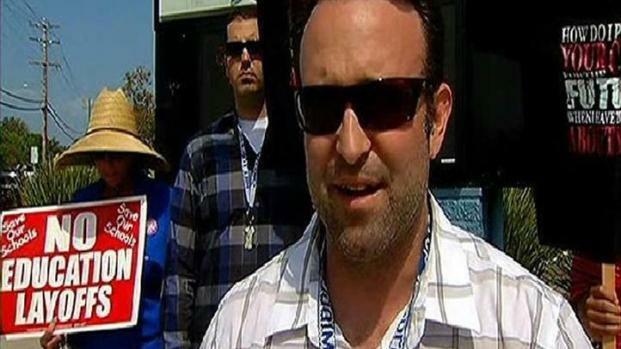 Hilltop teacher Ben Black along with parent Russel Simon and student Madison Perno speak with NBC 7's Danya Bacchus. Science teacher Ben Black worked to get the I-pad initiative in schools. “I received a pink slip notice there are several people trying to cover those positions, the students are struggling with everything up and working at points because there is no other program in place to provide the support needed for this program,” Black said. Starting next school year, iPads will be given to 7th graders in Sweetwater Union High District Schools. Right now, they're already being used by some students at Hilltop Middle as part of a pilot program. Black helped to convince the district the iPads were needed and now that the program is starting, he will no longer be involved. “I have personally invested in this program. I really want it to succeed and right now that's really in jeopardy,” Black told NBCSanDiego. Black believes without the help from teachers like him who have played in role in developing the iPad program, the $4 million a year initiative could fail. That idea upset several parents NBCSanDiego spoke to on Wednesday. "The whole situation is unacceptable to me as a parent and as a taxpayer,” Russel Simons said. Not to mention, the process is confusing for students. "My teachers are great and I don't see why they have to be laid off,” Madison Perno said. The money to fund the iPad program came from grants. Those funds cannot be used to pay teachers’ salaries. A district spokesperson said the schools have a team of teachers, administrators and the IT department that will work to move forward with the project.